The February issue of Circuit Cellar magazine is coming soon. 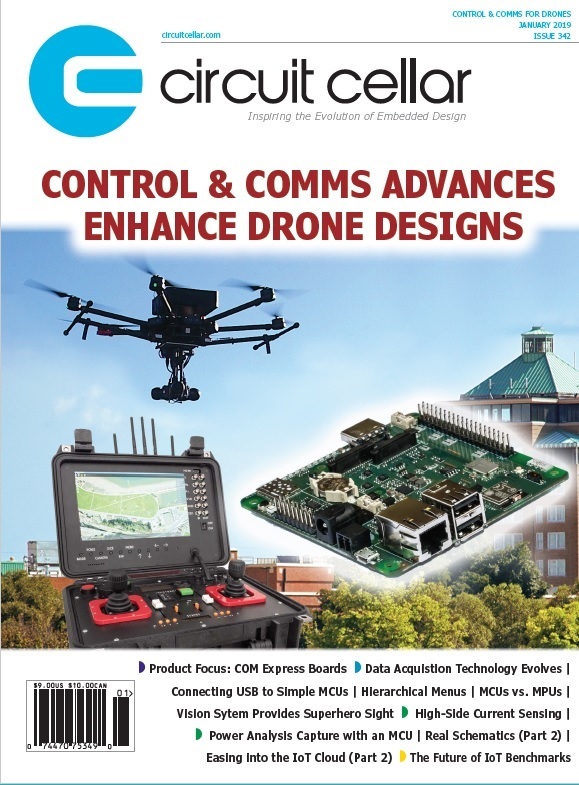 We’ve raised up a bumper crop of in-depth embedded electronics articles just for you, and packed ’em into our 84-page magazine. As automotive dashboard displays get more sophisticated, information and entertainment are merging into so-called infotainment systems. That’s driving a need for powerful MCU- and MPU-based solutions that support the connectivity, computing and interfacing needs particular to these system designs. 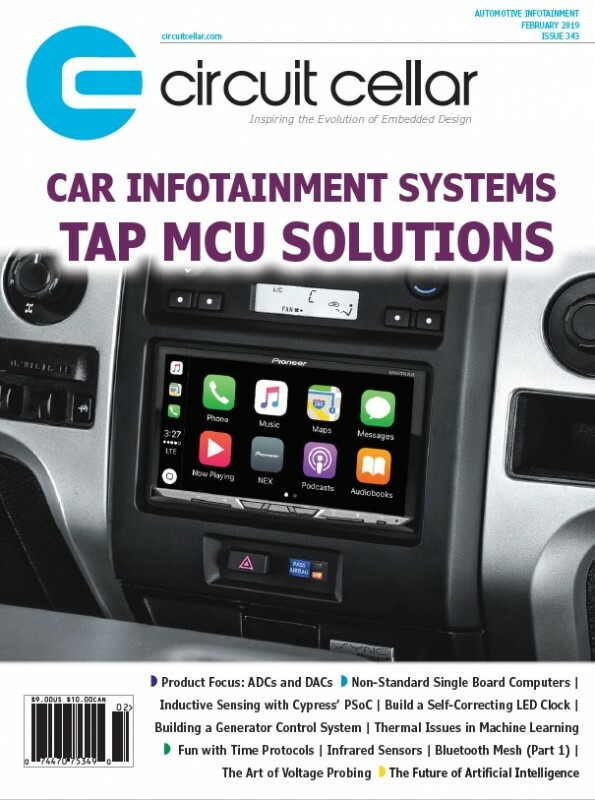 In this article, Circuit Cellar’s Editor-in-Chief, Jeff Child, looks at the technology and trends feuling automotive infotainment. Inductive sensing is shaping up to be the next big thing for touch technology. It’s suited for applications involving metal-over-touch situations in automotive, industrial and other similar systems. In his article, Nishant Mittal explores the science and technology of inductive sensing. He then describes a complete system design, along with firmware, for an inductive sensing solution based on Cypress Semiconductor’s PSoC microcontroller. In North America, most radio-controlled clocks use WWVB’s transmissions to set the correct time. WWVB is a Colorado-based time signal radio station near. Learn how Cornell graduates Eldar Slobodyan and Jason Ben Nathan designed and built a prototype of a Digital WWVB Clock. The project’s main components include a Microchip PIC32 MCU, an external oscillator and a display. Analog-to-digital converters (ADCs) and digital-to-analog converters (DACs) are two of the key IC components that enable digital systems to interact with the real world. Makers of analog ICs are constantly evolving their DAC and ADC chips pushing the barriers of resolution and speeds. This new Product Focus section updates readers on this technology and provides a product album of representative ADC and DAC products. Three phase electrical power is a critical technology for heavy machinery. Learn how US Coast Guard Academy students Kent Altobelli and Caleb Stewart built a physical generator set model capable of producing three phase electricity. The article steps through the power sensors, master controller and DC-DC conversion design choices they faced with this project. Although standard-form factor embedded computers provide a lot of value, many applications demand that form take priority over function. That’s where non-standard boards shine. The majority of non-standard boards tend to be extremely compact, and well suited for size-constrained system designs. Circuit Cellar Chief Editor Jeff Child explores the latest technology trends and product developments in non-standard SBCs. Artificial intelligence and machine learning continue to move toward center stage. But the powerful processing they require is tied to high power dissipation that results in a lot of heat to manage. In his article, Tom Gregory from 6SigmaET explores the alternatives available today with a special look at cooling Google’s Tensor Processor Unit 3.0 (TPUv3) which was designed with machine learning in mind. Wireless mesh networks are being widely deployed in a wide variety of settings. In this article, Bob Japenga begins his series on Bluetooth mesh. He starts with defining what a mesh network is, then looks at two alternatives available to you as embedded systems designers. Many embedded systems need to make use of synchronized time information. In this article, Jeff Bachiochi explores the history of time measurement and how it’s led to NTP and other modern technologies for coordinating universal date and time. Using Arduino and the Espressif System’s ESP32, Jeff then goes through the steps needed to enable your embedded system to request, retrieve and display the synchronized date and time to a display. Infrared sensing technology has broad application ranging from motion detection in security systems to proximity switches in consumer devices. In this article, George Novacek looks at the science, technology and circuitry of infrared sensors. He also discusses the various types of infrared sensing technologies and how to use them. Using the right tool for the right job is a basic tenant of electronics engineering. In this article, Robert Lacoste explores one of the most common tools on an engineer’s bench: oscilloscope probes, and in particular the voltage measurement probe. He looks and the different types of voltage probes as well as the techniques to use them effectively and safely. 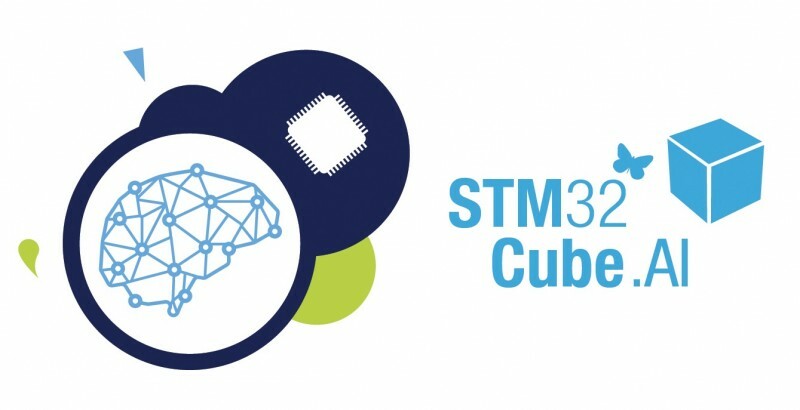 STMicroelectronics has extended its STM32CubeMX ecosystem by adding advanced Artificial Intelligence (AI) features. AI uses trained artificial neural networks to classify data signals from motion and vibration sensors, environmental sensors, microphones and image sensors, more quickly and efficiently than conventional handcrafted signal processing. With STM32Cube.AI, developers can now convert pre-trained neural networks into C-code that calls functions in optimized libraries that can run on STM32 MCUs. STM32Cube.AI comes together with ready-to-use software function packs that include example code for human activity recognition and audio scene classification. These code examples are immediately usable with the ST SensorTile reference board and the ST BLE Sensor mobile app. Additional support such as engineering services is available for developers through qualified partners inside the ST Partner Program and the dedicated AI and Machine Learning (ML) STM32 online community. ST will demonstrate applications developed using STM32Cube.AI running on STM32 MCUs this week in a private suite at CES, the Consumer Electronics Show, in Las Vegas, January 8-12. The STM32Cube.AI extension pack can be downloaded inside ST’s STM32CubeMX MCU configuration and software code-generation ecosystem. Today, the tool supports Caffe, Keras (with TensorFlow backend), Lasagne, ConvnetJS frameworks and IDEs including those from Keil, IAR and System Workbench. The FP-AI-SENSING1 software function pack provides examples of code to support end-to-end motion (human-activity recognition) and audio (audio-scene classification) applications based on neural networks. This function pack leverages ST’s SensorTile reference board to capture and label the sensor data before the training process. The board can then run inferences of the optimized neural network. The ST BLE Sensor mobile app acts as the SensorTile’s remote control and display. The comprehensive toolbox consisting of the STM32Cube.AI mapping tool, application software examples running on small-form-factor, battery-powered SensorTile hardware, together with the partner program and dedicated community support offers a fast and easy path to neural-network implementation on STM32 devices. Long gone now are the days when FPGAs were thought of as simple programmable circuitry for interfacing and glue logic. 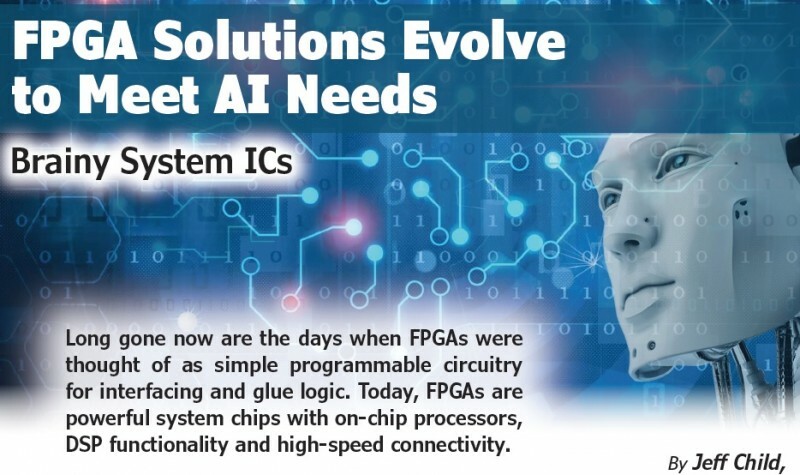 Today, FPGAs are powerful system chips with on-chip processors, DSP functionality and high-speed connectivity. Today’s FPGAs have now evolved to the point that calling them “systems-on-chips” is redundant. It’s now simply a given that the high-end lines of the major FPGA vendors have general-purpose CPU cores on them. Moreover, the flavors of signal processing functionality on today’s FPGA chips are ideally suited to the kind of system-oriented DSP functions used in high-end computing. And even better, they’ve enabled AI (Artificial Intelligence) and Machine Learning kinds of functionalities to be implemented into much smaller, embedded systems. 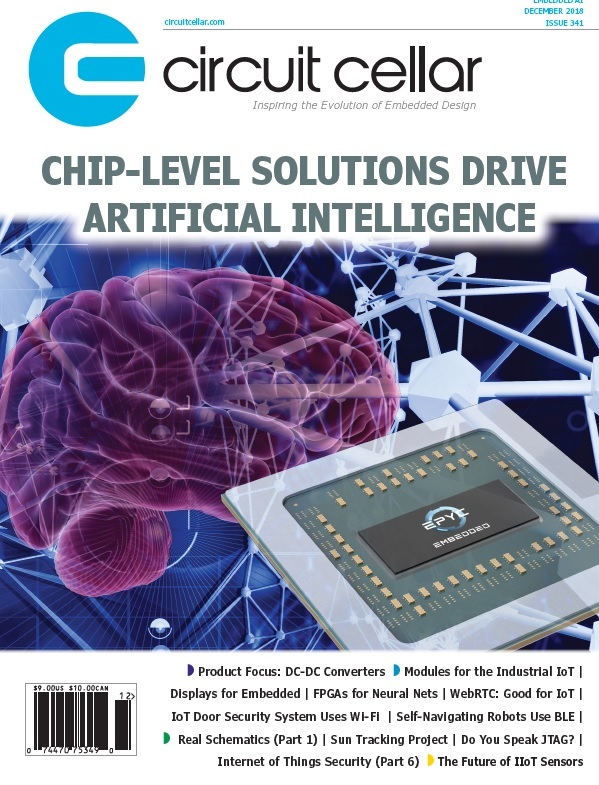 In fact, over the past 12 months, most of the leading FPGA vendors have been rolling out solutions specifically aimed at using FPGA technology to enable AI and machine learning in embedded systems. The two main FPGA market leaders Xilinx and Intel’s Programmable Solutions Group (formerly Altera) have certainly embraced this trend, as have many of their smaller competitors like Lattice Semiconductor and QuickLogic. Meanwhile, specialists in so-called e-FPGA technology like Archonix and Flex Logix have their own compelling twist on FPGA system computing. 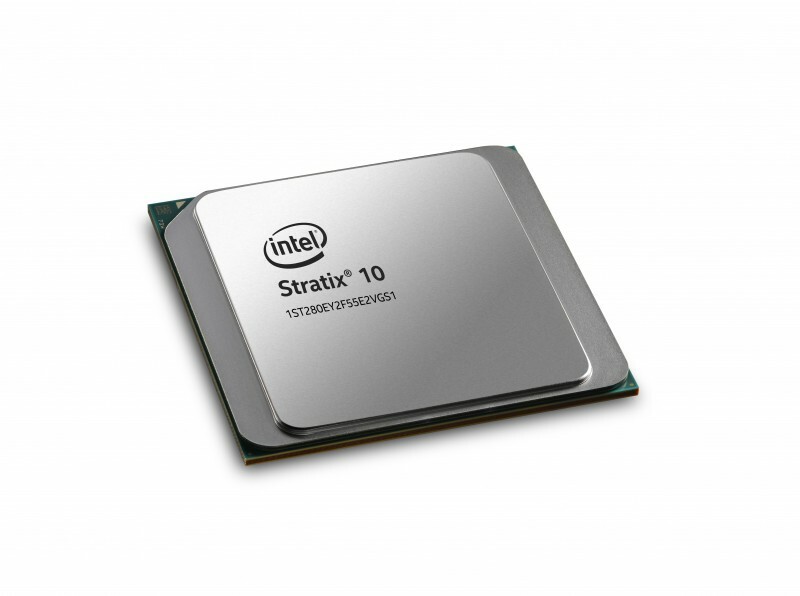 Exemplifying the trend toward FPGAs facilitating AI processing, Intel’s high-performance line of FPGAs is its Stratix 10 family. According to Intel, the Stratix 10 FPGAs are capable of 10 TFLOPS, or 10 trillion floating point operations per second (Figure 1). In May Microsoft announced its Microsoft debuted its Azure Machine Learning Hardware Accelerated Models powered by Project Brainwave integrated with the Microsoft Azure Machine Learning SDK. Azure’s architecture is developed with Intel FPGAs and Intel Xeon processors. Stratix 10 FPGAs are capable of 10 TFLOPS or 10 trillion floating point operations per second. Intel says its FPGA-powered AI is able to achieve extremely high throughput that can run ResNet-50, an industry-standard deep neural network requiring almost 8 billion calculations without batching. This is possible using FPGAs because the programmable hardware—including logic, DSP and embedded memory—enable any desired logic function to be easily programmed and optimized for area, performance or power. And because this fabric is implemented in hardware, it can be customized and can perform parallel processing. This makes it possible to achieve orders of magnitudes of performance improvements over traditional software or GPU design methodologies. In one application example, Intel cites an effort where Canada’s National Research Council (NRC) is helping to build the next-generation Square Kilometer Array (SKA) radio telescope to be deployed in remote regions of South Africa and Australia, where viewing conditions are most ideal for astronomical research. The SKA radio telescope will be the world’s largest radio telescope that is 10,000 times faster with image resolution 50 times greater than the best radio telescopes we have today. This increased resolution and speed results in an enormous amount of image data that is generated by these telescopes, processing the equivalent of a year’s data on the Internet every few months. NRC’s design embeds Intel Stratix 10 SX FPGAs at the Central Processing Facility located at the SKA telescope site in South Africa to perform real-time processing and analysis of collected data at the edge. High-speed analog transceivers allow signal data to be ingested in real time into the core FPGA fabric. After that, the programmable logic can be parallelized to execute any custom algorithm optimized for power efficiency, performance or both, making FPGAs the ideal choice for processing massive amounts of real-time data at the edge. For its part, Xilinx’s high-performance product line is its Virtex UltraScale+ device family (Figure 2). According to the company, these provide the highest performance and integration capabilities in a FinFET node, including the highest signal processing bandwidth at 21.2 TeraMACs of DSP compute performance. They deliver on-chip memory density with up to 500 Mb of total on-chip integrated memory, plus up to 8 GB of HBM Gen2 integrated in-package for 460 GB/s of memory bandwidth. 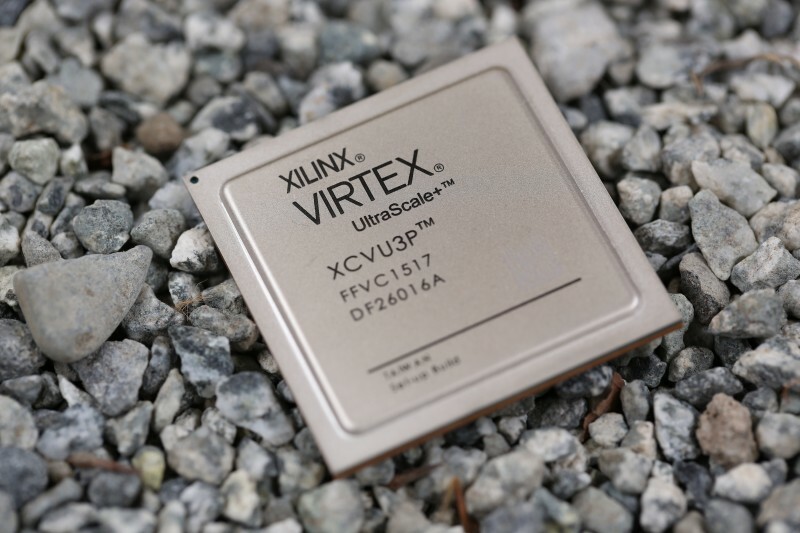 Virtex UltraScale+ devices provide capabilities with integrated IP for PCI Express, Interlaken, 100G Ethernet with FEC and Cache Coherent Interconnect for Accelerators (CCIX). Virtex UltraScale+ FPGAs provide a signal processing bandwidth at 21.2 TeraMACs. They deliver on-chip memory density with up to 500 Mb of total on-chip integrated memory, plus up to 8 GB of HBM Gen2 integrated in-package for 460 GB/s of memory bandwidth. 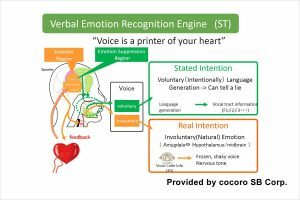 Renesas Electronics has announced that it has developed a development kit for its R-Car that takes advantage of “emotion engine”, an artificial sensibility and intelligence technology pioneered by cocoro SB Corp. The new development kit enables cars with the sensibility to read the driver’s emotions and optimally respond to the driver’s needs based on their emotional state. 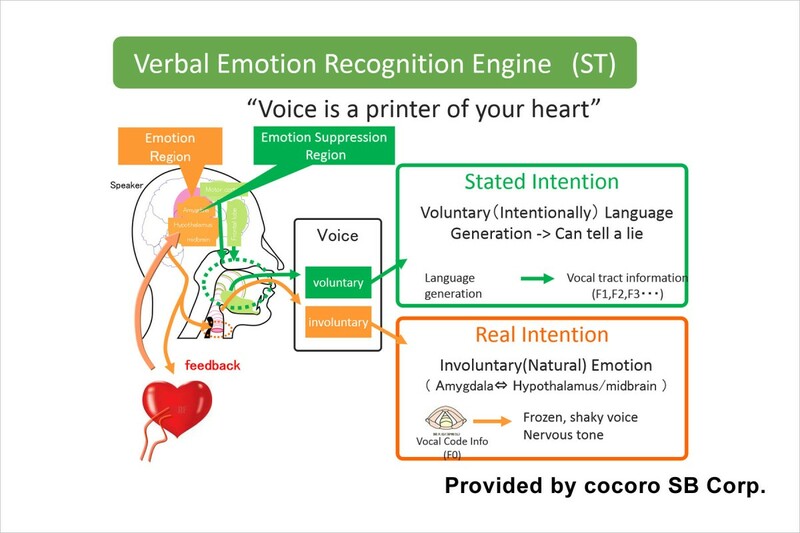 The development kit includes cocoro SB’s emotion engine, which was developed leveraging its sensibility technology to recognize emotional states such as confidence or uncertainty based on the speech of the driver. The car’s response to the driver’s emotional state is displayed by a new driver-attentive user interface (UI) implemented in the Renesas R-Car system-on-chip (SoC). Since it is possible for the car to understand the driver’s words and emotional state, it can provide the appropriate response that ensures optimal driver safety. As this technology is linked to artificial intelligence (AI) based machine learning, it is possible for the car to learn from conversations with the driver, enabling it to transform into a car that is capable of providing the best response to the driver. Renesas plans to release the development kit later this year. Renesas demonstrated its connected car simulator incorporating the new development kit based on cocoro SB’s emotion engine at the SoftBank World 2017 event earlier this month in held by SoftBank at the Prince Park Tower Tokyo. Renesas considers the driver’s emotional state, facial expression and eyesight direction as key information that combines with the driver’s vital signs to improve the car and driver interface, placing drivers closer to the era of self-driving cars. For example, if the car can recognize the driver is experiencing an uneasy emotional state, even if he or she has verbally accepted the switch to hands free autonomous-driving mode, it is possible for the car to ask the driver “would you prefer to continue driving and not switch to autonomous-driving mode for now?” Furthermore, understanding the driver’s emotions enables the car to control vehicle speed according to how the driver is feeling while driving at night in autonomous-driving mode. By providing carmakers and IT companies with the development kit that takes advantage of this emotion engine, Renesas hopes to expand the possibilities for this service model to the development of new interfaces between cars and drivers and other mobility markets that can take advantage of emotional state information. Based on the newly-launched Renesas autonomy, a new advanced driving assistance systems (ADAS) and automated driving platform, Renesas enables a safe, secure, and convenient driving experience by providing next-generation solutions for connected cars. Recent innovations in both hardware and software have brought on a new wave of interaction techniques that depart from mice and keyboards. The widespread adoption of smartphones and tablets with capacitive touchscreens shows people’s preference to directly manipulate virtual objects with their hands. This shows the hand tracking result from Kinect data. The red regions are our tracking results and the green lines are the skeleton tracking results from the Kinect SDK (based on data from the ChAirGest corpus: https://project.eia-fr.ch/chairgest/Pages/Overview.aspx). games with their entire body. More recently, Leap Motion’s new compact sensor, consisting of two cameras and three infrared LEDs, has opened up the possibility of accurate fingertip tracking. With Project Glass, Google is pioneering new technology in the wearable human-computer interface. Other new additions to wearable technology include Samsung’s Galaxy Gear Smartwatch and Apple’s rumored iWatch. A natural interface reduces the learning curve, or the amount of time and energy a person requires to complete a particular task. Instead of a user learning to communicate with a machine through a programming language, the machine is now learning to understand the user. Hardware advancements have led to our clunky computer boxes becoming miniaturized, stylish sci-fi-like phones and watches. Along with these shrinking computers come ever-smaller sensors that enable a once keyboard-constrained computer to listen, see, and feel. These developments pave the way to natural human-computer interfaces. If sensors are like eyes and ears, software would be analogous to our brains. Understanding human speech and gestures in real time is a challenging task for natural human-computer interaction. At a higher level, both speech and gesture recognition require similar processing pipelines that include data streaming from sensors, feature extraction, and pattern recognition of a time series of feature vectors. One of the main differences between the two is feature representation because speech involves audio data while gestures involve video data. For gesture recognition, the first main step is locating the user’s hand. Popular libraries for doing this include Microsoft’s Kinect SDK or PrimeSense’s NITE library. However, these libraries only give the coordinates of the hands as points, so the actual hand shapes cannot be evaluated. Fingertip tracking using a Kinect sensor. The green dots are the tracked fingertips. Our team at the Massachusetts Institute of Technology (MIT) Computer Science and Artificial Intelligence Laboratory has developed methods that use a combination of skin-color and motion detection to compute a probability map of gesture salience location. The gesture salience computation takes into consideration the amount of movement and the closeness of movement to the observer (i.e., the sensor). We can use the probability map to find the most likely area of the gesturing hands. For each time frame, after extracting the depth data for the entire hand, we compute a histogram of oriented gradients to represent the hand shape as a more compact feature descriptor. The final feature vector for a time frame includes 3-D position, velocity, and hand acceleration as well as the hand shape descriptor. We also apply principal component analysis to reduce the feature vector’s final dimension. A 3-D model of pointing gestures using a Kinect sensor. The top left video shows background subtraction, arm segmentation, and fingertip tracking. The top right video shows the raw depth-mapped data. The bottom left video shows the 3D model with the white plane as the tabletop, the green line as the arm, and the small red dot as the fingertip. The next step in the gesture-recognition pipeline is to classify the feature vector sequence into different gestures. Many machine-learning methods have been used to solve this problem. A popular one is called the hidden Markov model (HMM), which is commonly used to model sequence data. It was earlier used in speech recognition with great success. There are two steps in gesture classification. First, we need to obtain training data to learn the models for different gestures. Then, during recognition, we find the most likely model that can produce the given observed feature vectors. New developments in the area involve some variations in the HMM, such as using hierarchical HMM for real-time inference or using discriminative training to increase the recognition accuracy. Ying Yin is a PhD candidate and a Research Assistant at the Massachusetts Institute of Technology (MIT) Computer Science and Artificial Intelligence Laboratory. Originally from Suzhou, China, Ying received her BASc in Computer Engineering from the University of British Columbia in Vancouver, Canada, in 2008 and an MS in Computer Science from MIT in 2010. Her research focuses on applying machine learning and computer vision methods to multimodal human-computer interaction. 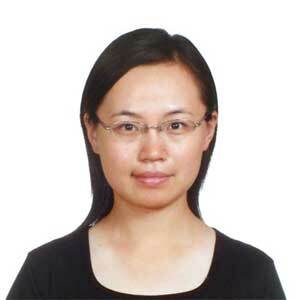 Ying is also interested in web and mobile application development. She has won awards in web and mobile programming competitions at MIT. Currently, the newest development in speech recognition at the industry scale is a method called deep learning. Earlier machine-learning methods require careful selection of feature vectors. The goal of deep learning is automatic discovery of powerful features from raw input data. So far, it has shown promising results in speech recognition. It can possibly be applied to gesture recognition to see whether it can further improve accuracy. As component form factors shrink, sensor resolutions grow, and recognition algorithms become more accurate, natural human-computer interaction will become more and more ubiquitous in our everyday life.